Here is my Garden Growing The End Of May. My spring irises are in full swing now and the first of my peonies has opened up. Oh joy. Come take a look at some of the flowers blooming in my garden. Here my Bowl Of Beauty peony has opened up. 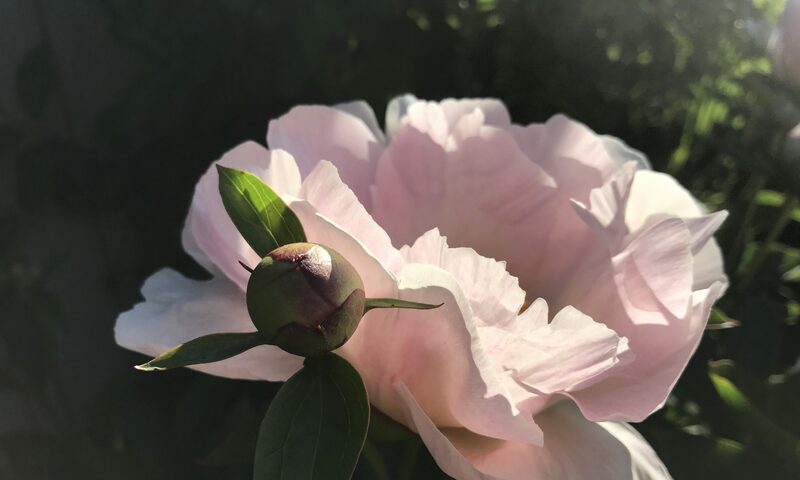 It is the first of my peonies to open. Several more are just getting ready to open. The vista in my backyard shows my garden path and some of the irises that are blooming in my garden. The Jacobs Ladder is in full bloom now. And my miniature rose Gourmet Popcorn is throwing off a few of its one inch blooms. 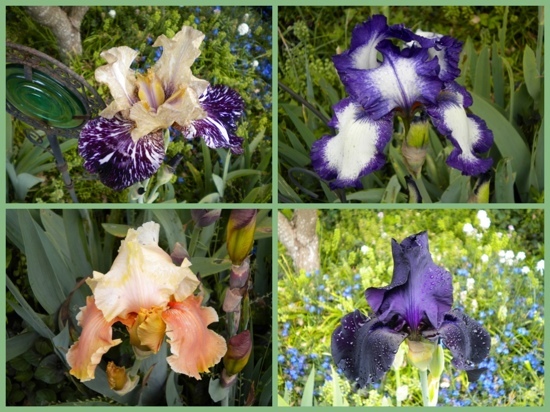 Here are four of my iris beauties. I just love the deep purple one and the marked one. Two more of my peonies are getting ready to bloom. Second time around is my white lupine baby of the dark blue one you can also see here. And finishing off are two of my Dutch Irises, one white and one blue. I really love Dutch irises, and I have started to get more of them. I hope that my new ones bloom this year. They are copper and maroon colors. This is all I have to show off this time. I am sharing this with Mosaic Monday and a new meme, Blooming Tuesday. I hope that you all enjoy what is blooming here on the end of May. 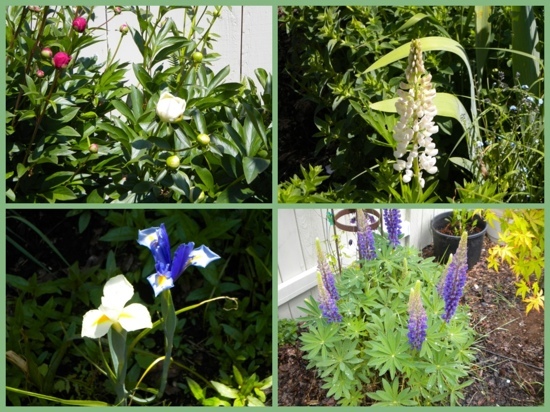 Your garden is blooming so well – love the irises. Mine are just coming out now. PS You make it very difficult to leave comments with the Captcha equation and the box to check confirming that I’m not a spammer. Would you consider becoming a verification-free blogger to make it easier for your readers? I certainly love my irises. It is so wonderful to see that you are getting roses already. That is something that I don’t yet have. I do have buds and beautiful foliage, but so far no blooms. Sorry about the Captcha thingie. I have gotten so much comment spam, I don’t quite know what to do. I’ll experiment without the plugin, but it may go back on if spam starts to drive me nuts. You do have some beautiful Irises. The deep purple and the purple edged white ones are so gorgeous. Your Bowl Of Beauty Peony is quite lovely too. Great blooms and great mosaics. Thanks. The purple edged iris is one I have had since I inherited it at a community garden. I have no idea of its name. I like it too. This morning I see that a couple more of my peonies will open, including one of my favorites, Hawaiian Coral. Lovely flowers, your gardens look beautiful. I love the peonies and the irises are my favorite. Lovely photos, have a wonderful week! Thanks. And thanks for coming by. This is such a lovely time. Irises and peonies are two of my favorites too, and they don’t bloom long enough.